I've been saving this buy/brag post, but I don't know for what! This shopping trip was to a local estate sale. I probably wouldn't have gone except that it started on a Wednesday. Isn't that crazy! But I wasn't there to stand in line for numbers, that is just over the top now, don't ya think! The sale was in a modest neighborhood and when I got there later in the morning it was pretty quiet. BUT a ton of stuff still in this house. An entire china cabinet full of Waterford crystal. Beautiful, but still pricey. 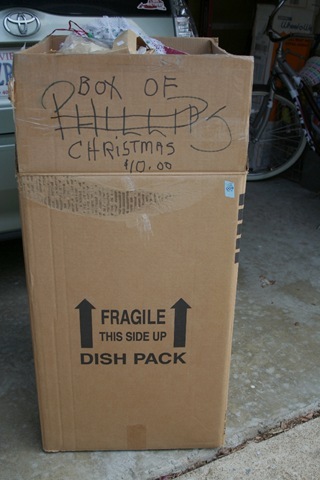 I found a few linens to buy, then I spotted this China Barrel packing box in the corner full of Xmas items for sale for $10 for the entire box. I peeked inside and saw enough that intrigued me, and so I decided to go for it. It was a giant china barrel grab bag!! I didn't even realize how heavy this box was until it was time to drag it to the car. The operative word here is DRAG! But I am a resourceful gal so I managed to fit it into the trunk of the Prius just fine. What was inside? Well, enough stuff to make the $10 worth it. I will use all this loot to make some vintage xmas wreaths for the local sale that BFF Beth and I are participating in on November 8. Wow!! That looks so worth $10!! What a fabulous find…you can brag, this is worth bragging about. Can’t wait to see some of your creations with these goodies. Ohhh!! Looks like you got a great haul!! Well worth the bragging! Wowser! 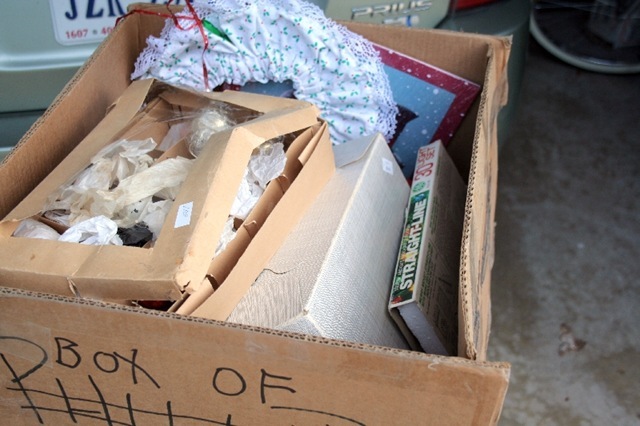 You did get a haul…I would have been bragging about that too! Can’t wait to see your creations! Great post! Love it, box of Christmas! Great stuff! Isn’t it fun to buy a box lot and find that there are some great treasures inside? I have a Prius, too. It’s amazing what I’ve been able to fit into that little trunk. Wow! My heart started beating faster just seeing the sign! Oh, you lucky, lucky girl! 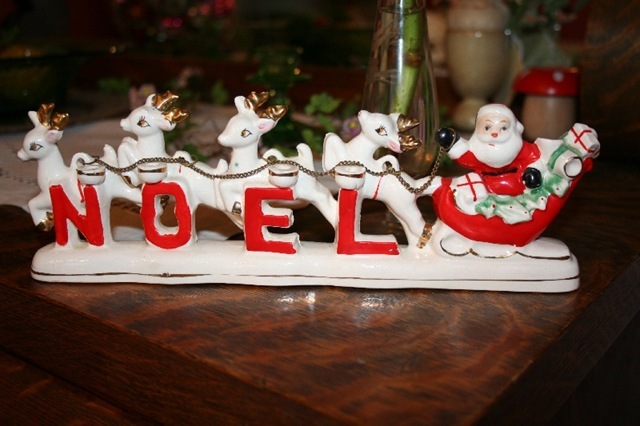 I get excited whenever I manage to find a few vintage Christmas things here and there! I can’t even imagine getting a huge box full like that. How wonderful! 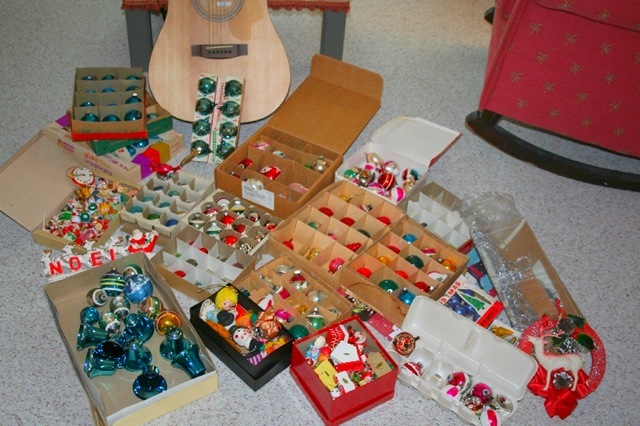 Well done Suzy….we all know how you love your vintage decs! Well done to you! Wheeeeeeeee Now that’s fun! Wish I could go through that box!!! Bet you had fun!